Swiss-based company VyprVPN recently underwent positive policy and programming changes for the better, making it a solid choice for anyone looking for secure, private internet connections at affordable prices. Boasting an impressive 700+ VPN servers all across the world, VyprVPN provides world-class security and encryption, competitively fast speeds, and an updated no-logging policy that’s been verified by third-party auditors. If you’ve been researching VPN providers, chances are you’ve come across reviews stating that VyprVPN logs your internet traffic and data. While that was once true, VyprVPN took that feedback from their customers and made very positive changes. Focusing on logging protocols, an easy user experience, and reliable speeds, VyprVPN went from a VPN provider that was not clear in its logging policy to one of the most secure providers in the world. While no VPN provider is perfect, we love how much VyprVPN has done recently to make the experience the best it can be. In our thorough VyprVPN review, we’ll go over the industry-leading security features, pricing, and the various ways that you can take advantage of this solid VPN service. VyprVPN has a unique pricing structure that is catered to a wide range of VPN users. All new users get a free three-day trial before committing to purchasing the service, giving you the chance to test servers, connections, internet speeds, and the VyprVPN user interface to make sure that the service is right for you. You can cancel your free trial at any time and won’t be charged for the service. If you want to continue using VyprVPN after your free trial, you’ll have multiple options depending on how long you need the service and what features you want in your VPN service. VyprVPN offers two service levels, VyprVPN and VyprVPN Premium. For those of you that don’t want to commit to a long-term service, you can choose between two month-to-month pricing options. VyprVPN is the basic VPN service that saves you money while still providing you with a lot of VyprVPN’s top features. For just $9.95 per month, you can connect up to three devices on your account. 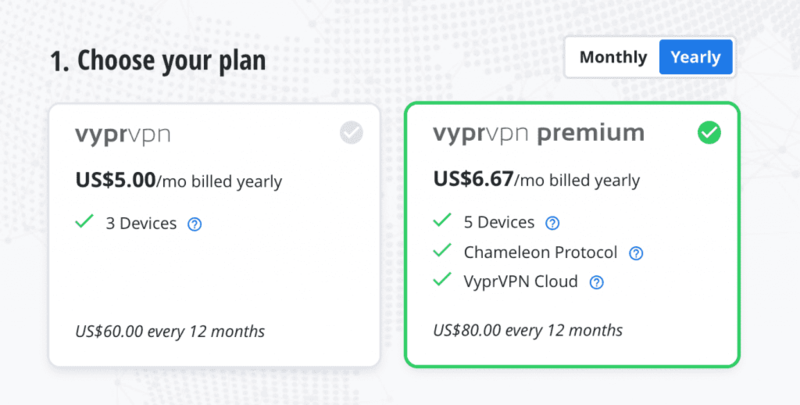 While $9.95 is less than what you’d pay for a month-to-month plan on most competitor services, it may not be the best value when compared to the VyprVPN Premium month-to-month option or the yearly options. VyprVPN Premium’s month-to-month option is just a few dollars more per month and offers even more fantastic features than you’d get with the basic service. With Premium services, you can connect up to five devices on your VPN account. In addition to more devices, you get VyprVPN’s proprietary Chameleon Protocol, which allows you to bypass geo-blocks on your favorite sites, meaning you can unlock even more great content. You also get your own cloud server that you control via VyprVPN Cloud. The VyprVPN Premium service is just $12.95 per month. If you know that you’re going to use VPN services for the long-term, a yearly option can save you a significant amount of money. VyprVPN basic service is $60 per year, which is just $5 per month billed annually. VyprVPN Premium is just $80 per year, or $6.67 per month billed annually. VyprVPN offers proprietary technology and a host of updated features to give you peace of mind when browsing online. The biggest, most prominent feature update that we’ve already mentioned is the new no-logging policy. Prior to the end of 2018, VyprVPN user data was logged and stored, which was a huge privacy concern for many users. Now, VyprVPN is the world’s first publicly audited VPN service to prove to consumers that zero data logs are kept. Remember, you won’t get all of these features when you choose the basic service, and will need to go with the Premium service if you want the proprietary Chameleon protocol and your own virtual cloud server. However, even with the basic service you do get an impressive lineup of features to keep you safe and secure online. If you’re concerned about your internet speed when connecting to a VPN service, as many of us are, VyprVPN does provide impressive speeds when benchmarking on various servers. There’s not much lost speed, even when connecting to international servers. By owning all of their servers, VyprVPN has direct control over the performance of each and every server across the world. All servers are optimized for modern broadband connections and support multi-gigabit connection speeds. You won’t experience throttling or bandwidth limits, allowing you to browse the internet quickly and securely. VyprVPN has a team of in-house engineers that are constantly updating and optimizing the vast network of servers. With four protocols to choose from, including VyprVPN’s proprietary Chameleon protocol, you have a much better chance getting around Netflix’s VPN and geo-blocking than you would with a service that has fewer options. While this can change at any time, there are currently no issues with accessing Netflix on VyprVPN. Netflix is doing everything they can to block VPN connections in order to restrict content to your location, however, VyprVPN currently has them beat. In addition to hundreds of servers and multiple protocols that allow you to bypass geo-restrictions, VyprVPN has dedicated how-to articles and resources on accessing geo-restricted content, making it one of the most Netflix-friendly VPN services around. There are VPN services out there that have dedicated P2P servers in their network or even support P2P on all servers in the network. While VyprVPN does not have dedicated P2P support or even mention torrenting on their site, their updated policies make it easier to share files across the network. For example, the updated no-logging policy means that filesharing information won’t be released and linked back to you, which was one of the major privacy concerns that users previously had. You may receive warnings and your account could be suspended if you’re caught torrenting copyrighted content, but only if VyprVPN is notified of the activity. You’re generally safe torrenting on VyprVPN, but we suggest proceeding with caution. VyprVPN makes it easy to get set up and connected on your Windows device, offering a dedicated desktop that you can download and use as your VPN interface. The desktop app is easy to use and is very straightforward. With no restrictions on how many times you change your server connection, you can connect to various servers around the world in just a few clicks. The dashboard itself has a lot of valuable information without being overwhelming. You can see important information such as your current server connection, IP address, and a list of servers that you can connect to. Virtually everything about your VPN experience can be chosen through the dashboard, including server connection, encryption type, and more. You won’t notice any speed or connection issues when using the Windows desktop app, and you can get set up on VyprVPN in just minutes. If you’re a Mac user, you can download the dedicated Mac desktop app to your laptop or desktop to make connecting to VyprVPN fast and simple. VyprVPN secures your internet connection and masks your IP address on all of your Apple devices, including MacBooks, iMacs, and iPhones. When compared to performance on Windows devices, there are no issues with connectivity, reliability, or speed, making VyprVPN a very consistent experience across all of your connected devices. Installation and setup are a breeze, allowing you to get connected to any VPN server across the world in no time at all. As we mentioned, VyprVPN has over 700 servers in more than 70 countries, making it a great option for those that like anonymity online. You can connect to a different server every day of the year if you need to, and if you are a frequent traveler, chances are there’s always going to be a server nearby. Servers are currently located in countries in North America, South America, Asia, Europe, Africa, and Oceania. What makes VyprVPN so unique is that they fully own and control all of their servers. Some VPN server providers use third-party servers to cut back on costs, which can be a privacy concern for some. VyprVPN will reroute traffic to the nearest server when one server becomes too full. This process is done automatically and in no way compromises your connection security. In fact, it makes for a faster, more reliable experience for everyone involved. VyprVPN lets you choose the security protocol that you use for each VPN session, giving you the freedom to choose what works best for you. You can choose between PPTP, OpenVPN, LT2P/IPsec, or Chameleon depending on what you’re looking for in terms of encryption, speed, and privacy. PPTP is a good choice if you’re looking for the fastest connection possible. Offering basic encryption, your data is fairly well protected and you’ll experience faster connection speeds due to the lower levels of encryption. The remaining protocols all offer the highest levels of encryption and authenticate data in different ways, including digital certificates and multiple encryption processes. These protocols are all available in 256-bit VPN encryption and fast speeds. 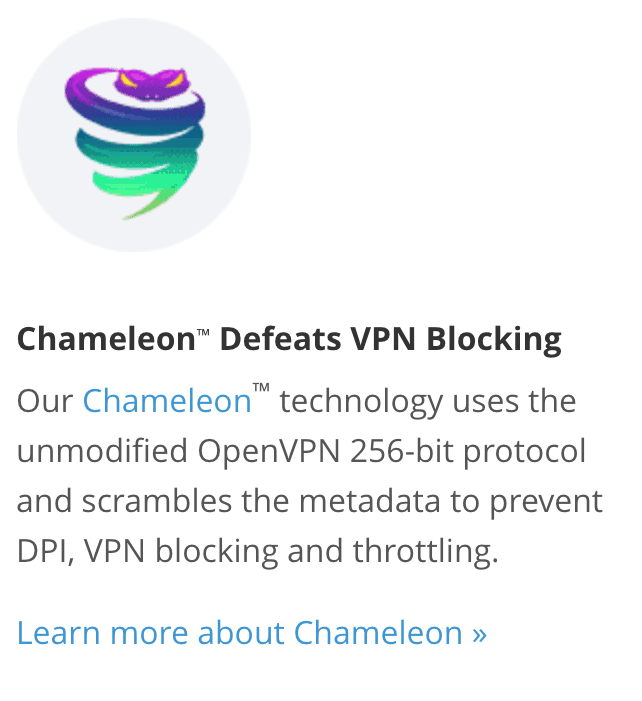 VyprVPN’s proprietary Chameleon protocol was specifically designed to circumvent geo-restricted content blocks, however, you may be able to access the same content with OpenVPN or LT2P/IPsec protocols. Regardless of your question or concern, VyprVPN has a team of dedicated support experts ready to help. Offering both live chat and email support options, you’ll get help 24/7. The email response team is typically fast at responses, with most responses coming in one to two days. For even faster help, hop on the live chat for instant live support assistance. The dedicated support page makes it easy to browse through various topics, from getting started with your VPN service to VyprVPN for NAS. The support guides are simple and easy to understand, but if you have additional questions, you can submit a request via email or start a live chat right from the support page. With many VPN providers still using the ticket support system, having a dedicated live chat team is a step up above the competition. We love the recent changes that have been implemented in the VyprVPN service. The quick change to an independently-verified no-logging policy is one of the most impressive changes that we’ve seen in any VPN service provider. What one was an extremely negative aspect of their service is now one of the biggest draws to signing up for VyprVPN. The pricing structure is simple and straightforward but gives you multiple options depending on your needs. Some users don’t need proprietary VPN protocols or dedicated VPN cloud servers, so why should they be forced to pay for them with “one size fits all” pricing? You can customize your experience even further by choosing your connection protocol for each of your VPN sessions. With four protocols to choose from (if you have the Premium service), you can find exactly what you need in terms of speed, connection, and privacy. VyprVPN is quickly becoming a top VPN service provider, and we are definitely excited to see even more great changes in the future.